Trichloracetic acid (TCA) TCA peels are used to correct fine lines, superficial scars, minimal laxity and pigmentation problems. It is very beneficial to persons of all skin types. Ethnic skin tones such as Asian, African-American, Italian and other darker skins tones can safely undergo beneficial resurfacing. This peel can be used not only on the face, but on the neck, chest, back, arms, hands, etc. Anywhere you wish to rejuvenate or improve your skin. TCA is the active ingredient in the Obaji peel which is a 15% or 20% solution applied in multiple layers by a doctor. PSC does not recommend more than 2-3 layers be applied without a doctor’s consent. You are a candidate if you have slight wrinkles, hyper pigmentations, splotchiness, unevenness, acne, acne scars, black heads or sun damaged skin. Very dark skinned individuals may use the TCA formulation, but it will not remove spotting in the skin. You should not have a chemical peel if you will continue to have excessive sun exposure. Active Herpes Simplex (have a doctor prescribe Zovirax for you), Warts, history of Keloidal scarring, any type of recent facial surgical procedures. 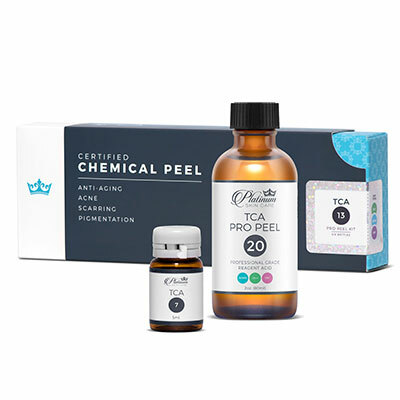 You should not have a chemical peel if you've used Accutane in the last year (it will increase your chances of scarring), or if you are pregnant or lactating. If you have any auto immune diseases, have had any recent radioactive or Chemotherapy treatments - have sunburn, windburn or broken skin or have recently waxed or have recently used a depilatory such as Nair or use Vaniqua. For the best results, you should follow a skin care regimen which may include the use of AHAs, Retin A, Kojic Acid, Alpha Arbutin, etc. to prepare your skin’s surface, and even out the skin tone itself. *EX- Serum 15 and Vitamin C Complex daily. This will make the peel more effective and will make your skin less likely you hyper-pigment. * Make sure you have a supply of SPF (100% uva & uvb) to protect your skin before and after the peel. A minimum of 30 is required. After your peel it will be important to moisturize your skin with a quality, healing ointment. We recommend Emu oil (or Hyaluronic Acid) mixed with Copper Serum, Bacitracin, or another comparable product. With 1 layer of 12.5% TCA there really should not be any severe peeling or redness, but with additional layers or higher percentages, ointments should be applied around the clock to keep the skin moist. 3-5 layers (Multiple layers should be done with extreme caution- *and should be worked-up to gradually). It is best to apply multiple layers in an office setting. Do not make excessive or widely exaggerated facial expressions during the peeling phase. This could cause your skin to tear and lead to scarring. Your skin may turn a brown color, and will shed off in approximately 7-10 days. Just let your skin heal naturally and DO NOT EVER tug on ANY skin that is peeling from your face (even if it is just hanging there). You can cause excessive damage resulting in severe scarring if you tear off a piece that is still attached at the end. 1 Layer = 1x every 1-2 weeks. 2-3 Layers = 1x every 2-4 weeks. 3-5 layers = 1x every 4-7 weeks. *Always perform a patch test 24 hours prior to application to test for sensitivity. Warning to client: Your skin condition and overall health are the biggest factors in determining if you are a good candidate for a TCA peel. Applying this product without proper consultation constitutes as using at your own risk. If you have any concerns as to whether you should be applying this peel, please see your doctor or dermatologists. READ entire front page for precautions and warnings! For best results: 2-4 weeks prior to peel, prepare skin by following a skin care regimen (as described on the front), to prepare your skin and even out the skin tone itself. *Do not apply RetinA or a leave-on acid product the day before your peel – Let it rest for 1 day. Never use abrasive products immediately prior to a peel (scrubs). The day before the peel, apply a test patch to check for irritation. Cleanse the skin with a deep cleanser. Apply Peel Prep Solution B to defatt and slightly numb the skin. Wet ½ of a 2” gauze or cotton pad (approximately. 25 drops) with the TCA solution. *(This is a guideline. You want the pad to be wet, but not dripping). Hold the dry ½ with your fingers to apply the peel with. Gently apply to the skin using a horizontal motion. Do not scrub into the skin. If you are an advanced peeler, you may now apply more layers of TCA for a deeper peel. Apply solution, wait 3-5 minutes for the skin to coagulate (frosting may be apparent), apply next layer – continue along for no more than 5 layers! You will probably frost at 3 layers (skin turns white). *Only add on 1 extra layer at a time per treatment. Take the process slow. It should be the 3rd. application before you get to 3 layers! Splash your face with cool water to soothe it after 3-5 minutes. TCA cannot be neutralized manually. It will stop on its own once it has completed the layer (within 4-8 minutes). After 5-10 minutes rinse solution off of face. Let skin dry and apply a healing ointment. Do not apply any exfoliating products at this time! Store product upright in a cool, dark closet. Keep away from children and animals! ALWAYS, ALWAYS, ALWAYS apply min SPF 30 while using this product. And for several months after! Cross method = 1x every 3-4 weeks. Warning to client: Your skin condition and overall health are the biggest factors in determining if you are a good candidate for a TCA peel. Applying this product without proper consultation constitutes as using at your own risk. If you have any concerns as to whether you should be applying this peel, please see your doctor or dermatologist. If you wish - protect fingers with a glove or finger cot. Soak toothpick in TCA solution for a 30 seconds – 1 minute. Apply solution to the interior only, of the depressed scar by applying firm (not to cause any bleeding) “pokes” into the scar tissue with the toothpick. The “poked” areas should frost (turn white) in a few seconds to a few minutes. *Splash your face with cool water to soothe it. After 5-10 minutes rinse solution off of face. Let skin dry and apply a healing ointment (Emu oil or Bacitracin) & spf 30+ every day. A crust (scab) should form within the treated area within 3-5 days. When this happens, you may discontinue the ointment in favor of a drier serum (such as Copper Serum) or you may still apply a very small amount of the ointment (Copper Serum & Emu). 7-10 days after the peel, the scabs will fall off.You may or may not notice an improvement at this time. The collagen production will continue for the next several months. You may repeat this application method every 30-45 days for more remodeling. Follow instructions 1-5 above then continue on below. Apply Vaseline to any areas you do not want to solution to peel. (eyes, nose…). Wet ½ of a 2” gauze or cotton pad (approximately. 20 drops) with the TCA solution. Hold the dry ½ with your fingers to apply the peel with. Make sure pad is not dripping, and gently apply to the skin using a horizontal motion. If you are an advanced peeler, you may now apply more layers of TCA for a deeper peel. Apply solution, wait 3-5 minutes for the skin to coagulate (frosting may be apparent), apply next layer – continue along for no more than 5 layers! You will probably frost at 2 layers (skin turns white). *Only add on 1 extra layer at a time per treatment. Take the process slow. It should be the 3rd. application before you get to 3 layers! You may splash your face with cool water to soothe it after 3-5 minutes. TCA cannot be neutralized manually. It will stop on its own once it has completed the layer (within 4-8 minutes). *Approximately 3 days after peel, the skin may turn a brownish color and spotting may be more apparent. This will peel off. DO NOT PULL AT ANY OF THE FLAKING SKIN! TO DO SO COULD CAUSE SCARRING. Be patient, apply ointment daily. If anything does not “look or feel” right to you, see a doctor for an evaluation! Part = any measure of liquid you would like to use. It could be a single drop of solution = 1 part, or 1 dropper full = 1 part. Whatever is easiest for you to follow. Either would be very simple. If you use a full dropper as a measurment, the dropper must be at same angle when dropping to deliver consistant amounts (preferably straight up/dwn). *To avoid unecessary waste, only mix as much solution as you are ready to use at a single application. 10% = 1 part TCA + 2 parts Water 1-2 layers Apply no more than 1x every 10 days. 3-5 layers Apply no more than 1x every 2-4 weeks. 15% = 1 part TCA + 1 part Water 1-2 layers Apply no more than 1x every 3-4 weeks. 3-5 layers Apply no more than 1x every 4-7 weeks. 20% = 2 parts TCA + 1 part Water 1-2 layers Apply no more than 1x every 3-5 weeks. 25% = 5 parts TCA + 1 part Water 1-2 layers Apply no more than 1x every 4-7 weeks. 3-5 layers Apply no more than 1x every 2-4 months. 30% = Solution only** 1-2 layers Apply no more than 1x every 3-4 months. **We do not recommend this for facial usage! 3-5 layers We do not recommend this type of application! **Platinum Skin Care does not recommend the usage of a multiple layer 20%-30% TCA peel outside of a doctor’s care. Apply a degreaser such as Isopropyl Alcohol to defatt the skin. You may apply a 2nd time. 7-10 days after the peel, the scabs will fall off. You may or may not notice an improvement at this time. The collagen production will continue for the next several months. You may repeat this application method every 30-45 days for more remodeling. If you are an advanced peeler, you may now apply more layers of TCA for a deeper peel. Apply solution, wait a few minutes for the skin to coagulate (frosting may be apparent), apply next layer – continue along for no more than 5 layers! You will probably frost at 2 layers (skin turns white). *Only add on 1 extra layer at a time per treatment. Take the process slow. It should be the 3rd. application before you get to 3 layers! Splash your face with cool water to soothe it after 3-5 minutes. TCA cannot be neutralized manually. It will stop on its own once it has completed the layer (within 4-8 minutes). *Approximately 3 days after peel, the skin may turn a brownish color and any spotting will be more apparent. This will peel off. DO NOT PULL AT ANY OF THE FLAKING SKIN! TO DO SO COULD CAUSE SCARRING. Be patient, apply ointment daily. If anything does not “look or feel” right to you, see a doctor for an evaluation! Purified Water, Trichloroacetic acid, Propylene Glycol, Citric Acid, Lactic Acid, Sodium Lactate, Glycine, Fructose, Urea, Niacinamide, Inositol, Sodium Benzoate, Benzyl Alcohol. pH 1.2 - 1.4.